Material: Ranging from sheep gut to metals, the range of materials vary widely; material is the factor that most influences a string's sound. Gauge: The diameter or thickness of a string directly influences its tension or stiffness. A thicker/heavier string typically has higher tension and requires you to put more pressure on a string to make a sound. A thinner/lighter string typically has lower tension, will bend pitch easier and requires less pressure. Each brand has its own designation system for gauges. In addition to understanding these categorical differences, you also should consider how you intend to use the strings. Strings chosen for playing bluegrass, for example, might not be a strong choice for playing Beethoven. This guide will help you decide the right strings for you by breaking down the options available and making suggestions based on musical genre, skill level and other factors. Uncovered gut strings - Photo by Steve Snodgrass. The oldest type of strings are made of sheep gut and date back centuries. Typically they are now wrapped in aluminum or silver wire. Known for having a warm and complex sound with lots of full overtones, their lower tension tends to make them more pliable under the fingers compared to other types of strings. Of all string types, gut strings have the slowest response, making them good for expressive playing. Gut strings also are more sensitive to temperature and humidity than any other type of string and it will take about a week before they are broken in to the point you won’t have to retune constantly. Due to these tuning issues, they are not recommended for beginner or intermediate students, or for use under hot stage lights. Gut strings break easily, and so steel-core E strings were developed early in the 20th century; the rest of the string set soon followed. The tone of steel-core strings is simple, clean, direct and pure. However, steel strings are not full of overtones and lack the richness of sound more advanced players desire. Some find steel strings too bright or thin sounding, though this quality is not as pronounced in cellos and basses. Known for their durability, steel-core strings are stable in pitch with a short break-in time. Some added bonuses are their affordability and quick response. Beginners should start with steel-core strings. About 40 years ago, strings with a core made of Perlon, a type of nylon that balanced the pros and cons of gut and steel-core strings, were introduced. They have the tonal qualities of gut but also some of the pitch stability of steel-core. The string response also is faster than gut, offer a one- to two-day break-in time and won’t require constant retuning. Newer core materials, known as “composite,” have been created with more complex tonal characteristics than nylon, so some variety in sound exists within this category. Many professional-level players who previously used gut now use synthetic-core strings. Sometimes labeled as “mittel,” medium strings are by far the most popular. They offer a good balance between the pros and cons of gauge varieties. Specifically, they balance the volume of thicker gauge strings with the responsiveness of a thinner gauge. 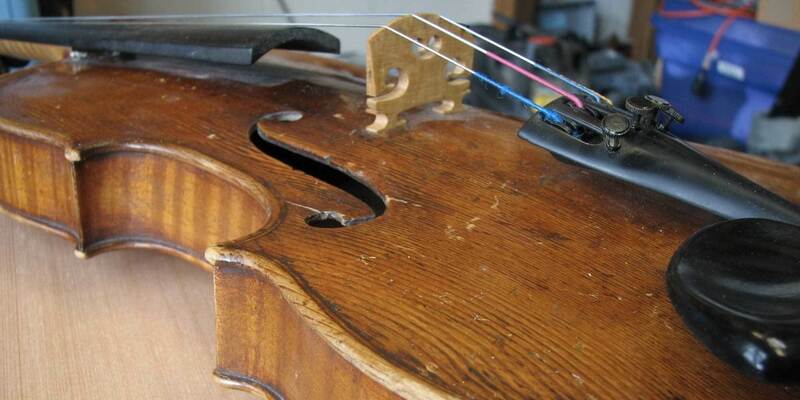 If trying a new string, consider starting with mediums. Sometimes labeled as “weich,” these strings tend to have a lower tension, a brighter, more responsive tone, and a more focused sound. Generally, they will be lower in volume than medium gauge strings, but may feel more pliable under the player’s fingers. Some players find that light strings bend too easily under the fingers, affecting intonation. I have personally found that they break more easily than medium and thick strings. Sometimes labeled “stark,” heavy strings have a darker tone but slower response compared to medium strings. These strings can provide more power and fullness of tone, but some players find them harder to play on, since they feel thicker under the fingers, and more finger pressure is necessary to create a note. Beyond personal preference in sound and feel, it’s important to consider the string’s use and purpose. A particular string may be great in one scenario, but awful in other. 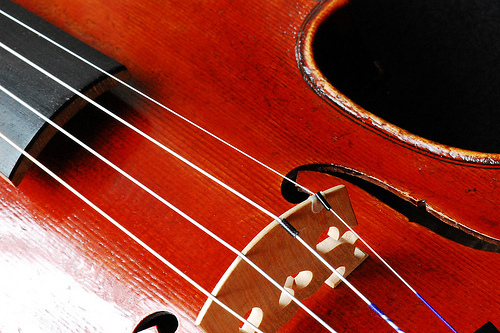 Here are some general suggestions based on the type of violin and genre. Steel-core strings are popular for electric instruments, but choices depend on the instrument’s pickup. If there is a magnetic pickup, steel-core strings are a must. Otherwise the pickups won’t detect the strings’ vibrations. Piezo pickups read pressure changes under compression, thus any type of strings work. 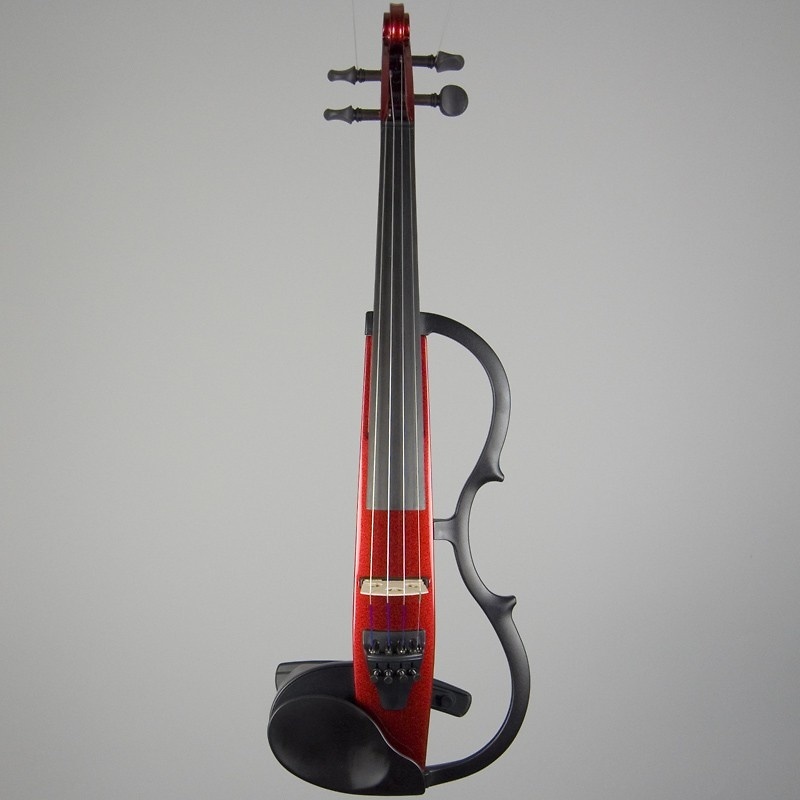 However, since electric instruments are more typically played in environments with more variable temperature and pressure, gut strings are usually not a good idea. Acoustic instruments can use any type of string with only a few exceptions. For fractional-size instruments (⅛, ¼, ½, ¾) steel-core strings typically are recommended. An even sound is desired across all four strings, so mixing string types, with the exception of the E string, is not recommended due to the variance in volume. For example, when you have a gut G string and steel core D string, you are changing the sound quality across the instrument. Addressing some violin myths and misconceptions is an important first step before shopping, so your search is not misguided by misinformation. 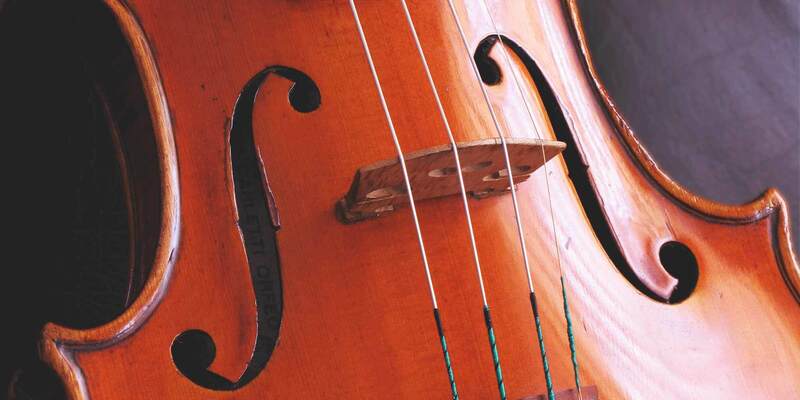 Classical players usually use gut or synthetic-core strings, with the exception for beginning players, who benefit from steel strings’ durability, pitch stability and affordability. Gut and synthetic-core strings are capable of creating a much more colorful tonal range, which is useful in classical music. For classical soloists, strings with articulation, power, depth and brilliance are usually preferred. 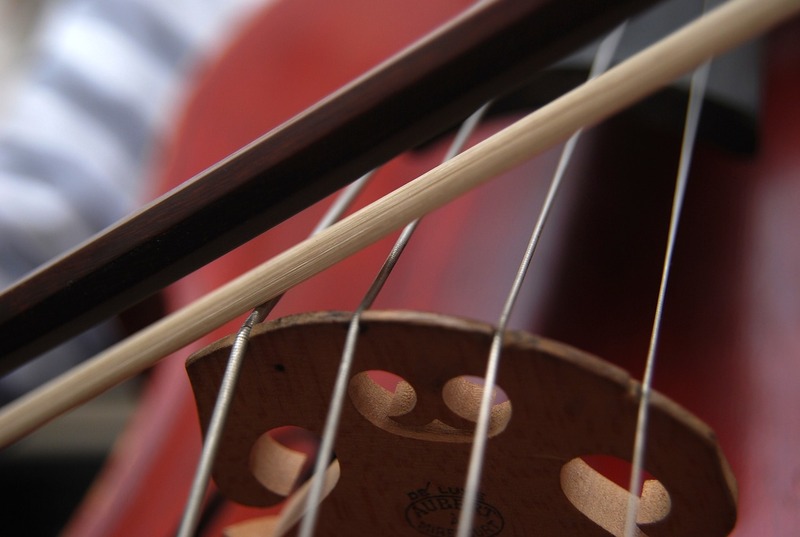 For orchestral players, strings with qualities that blend well with a group are the standard. Jazz players, in many instances, have the same needs as soloists. Expressive, powerful strings are helpful. First, consider whether the instrument is acoustic or electric. After that, consider the tension of the string; jazz players do more bending and sliding of notes, which is easier on the fingers with lighter gauge strings. Steel-core strings work well for bluegrass, folk, country and other genres that call the violin a “fiddle.” The precision of steel core is great for of fast, loud and clear notes. Their brilliant tone tends to blend well with the other instrumentation in these genres. They also stay in tune under the variable conditions of different venues and are durable when on the road. It will likely take some experimentation to select the right strings, but this highly personal process has already begun. You now can use this framework of knowledge and narrow your best options. If you select strings that don’t feel or sound quite right, try to pinpoint exactly what you don’t like about the sound or feel, and then use this feedback to refine your search and try again. This is a valuable process that is almost never complete, as even professionals change instruments and strings. This can happen as our needs or wants change over time. What won’t change is the knowledge that you now have to mold your string sound to your heart’s content.